These small round feeders are very unique and colorful, and will really liven up your garden! Cardinals, chickadees, finches, nuthatches and small woodpeckers all feed from this colorful little birdfeeder. In addition to being a seed feeder, it can also be used as a suet feeder. They are made with clear glass circular panels on each end allowing you to view the birds from any angle. 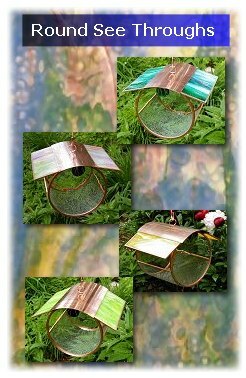 The top is made from colorful glass panels and sheet copper. Think bold and bright: teal, chartreuse, bright yellow, red, pink and green, etc. There are so many beautiful glass colors that can be incorporated into this feeder that will make it a focal point in your garden. All of the glass is trimmed in copper. A coordinating glass jewel wrapped in copper wire adorns each end. This feeder comes ready to hang with a copper hook. The opening allows chickadees, nuthatches, cardinals and finches to enter to feed, but keeps out jays and grackles. It holds 2-3 cups of safflower or sunflower seeds, but can also be used as a suet feeder. Approximate size is 7" in diameter x 8" in length.